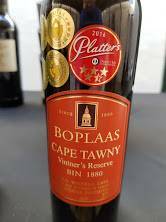 Is the Boplaas Cape Tawny Bin 1880 NV better now than it was on release? According to Carel Nel, head of the Calitzdorp cellar renowned for its fortified wines, Cape Tawny does evolve under cork, if very slowly. The wine, which was compiled from component parts matured for 15 years on average and bottled two years ago, seems to have only gained in composure. A blend of Tinta Barocca and Touriga Nacional, it has faded surprisingly little in colour still being red at centre. On the nose, red fruit, some nuttiness, dried herbs and spice but still very little overt caramel character. The palate meanwhile appears pleasantly thick textured with layers and layers of flavour, the finish very long indeed. A wine of striking balance and complexity. Price: R250 per 375ml bottle. Done this kind of experiment plenty of times. Of course tawny evolves under cork. And generally in a very good way.